We bag and board these comic books while wearing our famous White Cotton Gloves with BCW Anti-Acid Bag and Boards and give it to you 100% FREE!! We check all comic books (up to 2,000 copies individually) every week making sure you get as close to a 9.0 Raw Grade. We also let EVERY CUSTOMERS....and ENCOURAGE our customers to read the sample books in front of the ones that are bagged and boarded. We want you to be happy with the comic books you're about to purchase, rather than leaving disappointed not knowing what you've just bought. Not to mention we give up to 50% off in discounts.....DAILY!! All Discounts are OFF Retail Price...No Price Hike...You Receive FULL Discounts! we give the MOST DISCOUNTs in all of the Greater Miami Area.. These are just a few reasons why our customers trust us with their subscription EVERY WEEK! Below are the awesome discounts they receive....DAILY! multiverse corps. comics (Prime) Subscriber member Benefits all include 100% free bag and boards....and there's more! o Receive EVERYDAY DISCOUNT OF 5% OFF retail ALL SINGLE ISSUE ITEMS!! o Receive EVERY WEDNESDAY DISCOUNT OF 17% OFF retail ALL SINGLE ISSUE ITEMS!! o Graphic Novels are 10% OFF Retail! o Back Issues are 50% OFF retail! o An attentive shopping asst. o Receive EVERYDAY DISCOUNT OF 10% OFF retail ALL SINGLE ISSUE ITEMS!! o Receive EVERYDAY DISCOUNT OF 15% OFF retail ALL SINGLE ISSUE ITEMS!! *Please Note: Legacy Members benefits differ from Prime Members. **Want More Discount? !...Ask us about our LEGACY SUBSCRIPTION and join hundreds of subscribers who are saving EVEN MORE!! BCW Anti-Acid Bags and Boards are 100% FREE!! Your word is your bond, and our store is proof of this. If you recommend our store to your good friends you know we will show them the same TREATMENT you get. 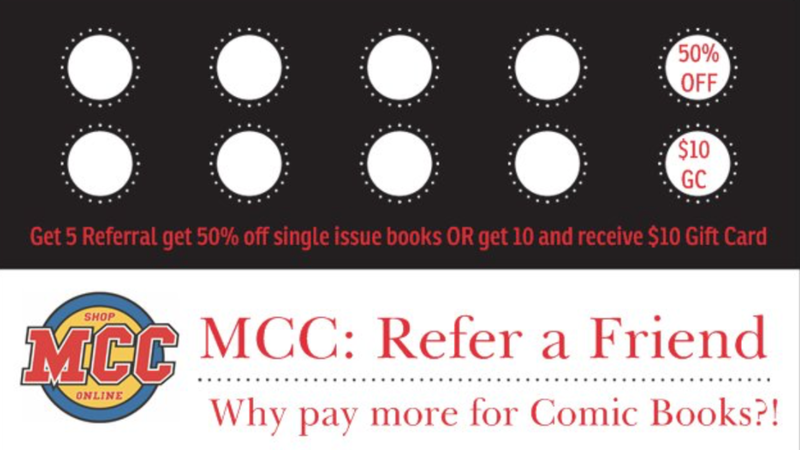 Each circle represents a friend you recommend, once you’ve reached the first hole you can take 50% OFF on all single issue items you have in your pull-list that week and every single issue in the store. Your can give that up and keep moving until the 10th friend and you’ll receive a $10 store GC. 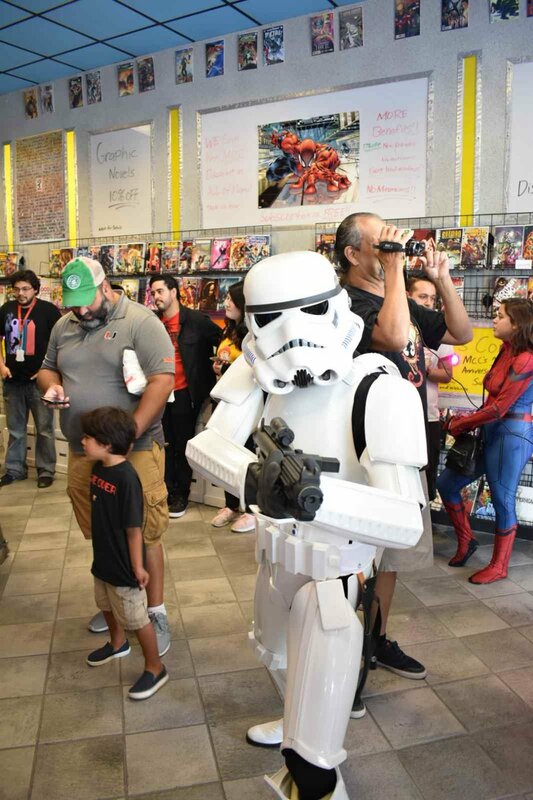 *Rules: Referral friend(s) need to stay at least 30days, have at least 5 items on their pull-list and pick up their pull-list items at least once. THE most amazing and notorious loyalty program is…back! When it was first introduced it was a FIRST of it’s kind, a bold new program that gives YOU, the customer, the power back to CHOOSE. To Choose BETTER, to Choose what’s BEST. No longer will you be bound to Unsatisfactory Customer Service, Unsatisfactory Experience and subpar quality books. The Switch gives you the POWER you’ve always had as a customer….The Power of Choice! Make ‘The Switch’ here’s how: Once you’ve made a decision that you deserve; Better Service, Better Experience, Better Quality Books. 2) Switch them over to our store. 3) Receive 50% off on everything on your Subscription and other single issue books in the store after 30 days. 2) Pick up your Subscription/Pull-List at least once within 30days. 3) Subscription should be at least 30days old. Pull comics to reserve and ready for pick up, up to 37 days!! Sign up for our E-Mailing List and you will be the first one to find out any up coming sales, promo, give aways! Up to date news before everyone else knows! Remember: All our books are handled by white gloves, bagged in free anti-acid backboards and are as close to a 9.0 raw grade!! No limit to put on hold!! Become part of the change…Disrupt the system! 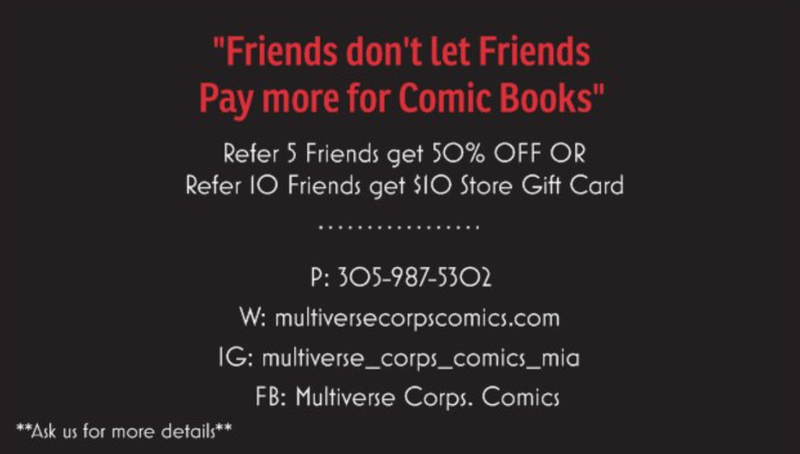 You deserve a better comic book store experience....Let Multiverse Corps. Comics show you what's better. Please use this space to request specific items you would like to put on hold. Specific book title and issue number. Thanks for the subscribing, we'll get back to you ASAP if you have a question!